Ebola survivor Salome Karwah holds a 10-month-old baby whose parents are being treated for Ebola inside the MSF Ebola Treatment center ELWA 3 in Monrovia, Liberia. Salome Karwah, 26, lost both her parents to Ebola. On August 28, she walked out of the same Monrovia treatment center where they had died, a survivor of the virus. And then one month later, she returned. Ebola treatment centers are full of divisions: between sick and healthy, confirmed and suspected, dirty and clean. 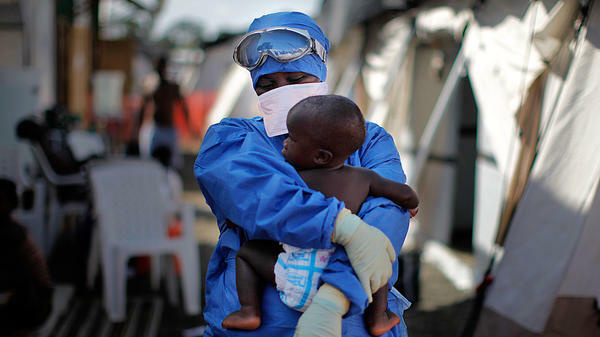 Karwah is standing in a fenced-in ward of suspected Ebola patients, gently bouncing a 10-month-old baby against her chest. "I help patients who are helpless," she says. "I help a lot of the babies. Some of them, without their parents, they cry a lot." The baby begins to whimper. "They were breast feeding. It's hard!" As a survivor, Karwah is immune to the current strain of Ebola, which makes her an ideal employee at the clinic. But even with immunity, an Ebola treatment center is a difficult place to work. There is a lot of death. Everyone who chooses to work there – volunteers, survivors, body collectors – feels some sense of duty to fight the epidemic. "It was not hard to come back," says Karwah. "Of course I lost my two parents here... but if I can help someone survive, I will be very happy." It's hard not to tear up thinking about what she's been through. One of the doctors working alongside her at the treatment center can't help it. "That's the most profound thing," says Dr Daniel Lucey. His eyes well up, but he doesn't wipe them. Rule number two of operating near Ebola, after washing hands, is don't touch your face. Lucey, an infectious disease physician at Georgetown University, will be working at the treatment center a total of five weeks during this trip. He hopes to come back again. Karwah has no plans to leave her job until the epidemic is over. It's hard to imagine when that will be. It struck me that Monrovia feels more like a city preparing for Ebola to stay than a city expecting it go away anytime soon. Ambulances scream down main streets, and sirens are drowned out by the sounds of construction equipment building new clinics. The president has canceled school until March, a full year after the epidemic in Liberia began. Despite current efforts, it still feels like Ebola is winning there. It's surreal, then, to return to the U.S. and find mild hysteria. To read headlines like, "Can Dallas Defeat Ebola?" A woman on my flight from Washington, DC, back to California is wearing rubber gloves. People seem confused and scared without knowing why. At the airport when I arrive home to Los Angeles, a man comes up to me in the crowd outside the terminal. "Can I borrow your phone?" he says, scanning the crowd. "I know my girlfriend is here somewhere, but my iPhone died!" His hand brushes against mine as I hand him my phone. He dials her number, then looks up at me as if remembering something. "I guess I should ask, are you coming back from West Africa?" "Ummm, yeah," I say, confused. How does he know? Or wait, is he asking because he's afraid of me? "Actually I am." But he's not listening. He puts the phone to his ear, laughing as if I must be joking. "Just had to ask. You know, like before I touch your phone and stuff. Hi! Honey, I'm here, under the JetBlue sign...."
"Thanks," he says when he hands it back. "You're a life saver." And our producer, Rebecca Hersher, was traveling with Jason Beaubien in Liberia two weeks ago. She's back now and with me in the studio. Becky, we just heard from Jason about the efforts to protect health workers adequately. But you also met with some health workers who don't need the heavy protective equipment to stay safe. Tell us about them. REBECCA HERSHER, BYLINE: Well, these are Ebola survivors, Arun. We met a lot of them. Double the number of people who have died of Ebola have gotten it, so there are a lot around. And they're a hot commodity. First of all, because they're immune to the disease now - and so they can work in clinics without all that heavy protective equipment. Also because the government holds them up as an example of surviving. It's hopeful. One of the major barriers in Liberia in West Africa to treating the disease is that people are afraid to go to hospitals. It's seen as a place where people die. And so holding up a survivor and saying this person survived Ebola - that's a really powerful thing. RATH: Is there any stigma within - any problems with the fact that they did have the disease - people might be afraid that they're still carriers? HERSHER: Yeah. That's a really big problem. There's a lot of stigma. I met one woman whose parents - they had died of Ebola. And she was a survivor. And she had actually come back to the clinic where she had been treated, where her parents had died to care for kids. And let's hear from her. Her name is Salome Karwah. She's 26 years old. SALOMA KARWAH: I help patients who are helpless. I bathe them. I feed the ones that are not able to eat and take care of their kids that their parents are positive. HERSHER: She's talking children, babies, even who come in with parents who are sick and who are confirmed to have Ebola. Now, these kids are at high risk for getting the disease - some of them are not showing symptoms yet. And so the work she's doing is really important. It's also really stigmatized. RATH: Becky, when you were in Liberia, the CDC announced new screening protocols for travelers coming to the U.S. from West Africa. What was your experience coming back to the U.S.? And what precautions have you been taking since you've been back? HERSHER: People are being given this piece of paper that says hand this to your doctor if you get sick in the next 21 days. And this is a piece of paper that has all of the symptoms of Ebola on it. And it's meant to help doctors, who are dealing with patients who are coming back from West Africa from one of the countries that's been affected by Ebola. It has a hotline for the CDC. It has a list of things to watch for. And the first thing is says is isolate this patient. That combined with taking your temperature daily - and I've been doing that twice a day - is really the best defense because this disease is not dangerous until you show symptoms. And so the most important thing is to screen for symptoms and watch yourself for symptoms - and that's what I'm doing. RATH: ALL THINGS CONSIDERED's own Rebecca Hersher. Becky, great work. It's really nice to have you back, though. HERSHER: Thanks. Transcript provided by NPR, Copyright NPR.